A major challenge in evolutionary biology is to understand the typically complex interactions between diverse counter-balancing factors of Darwinian selection for size-assortative mating and sexual size dimorphism. It appears that rarely a simple mechanism could provide a major explanation of these phenomena. Mechanics of behaviors can predict animal morphology, such like adaptations to locomotion in animals from various of taxa, but its potential to predict size-assortative mating and its evolutionary consequences has been less explored. 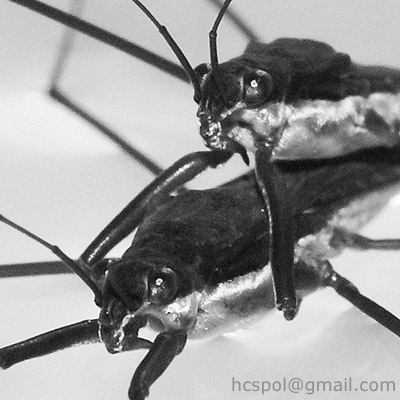 Mate-grasping by males, using specialized adaptive morphologies of their forelegs, midlegs or even antennae wrapped around female body at specific locations, is a general mating strategy of many animals, but the contribution of the mechanics of this wide-spread behavior to the evolution of mating behavior and sexual size dimorphism has been largely ignored. Han CS, Jablonski PG, Kim B & Park FC. 2010. Size-assortative mating and sexual size dimorphism are predictable from simple kinematics of mate-grasping behavior. BMC Evolutionary Biology 10:359. 전 제 사촌이 웹 사이트를 제안했다. 이 게시물이 다른 아무도 내 문제에 대한 이러한 http://seobacklinkservice.org/ 세부를 알고 그에 의해 작성되어 있는지 모르겠습니다. 당신은 정말 놀라워요! 감사합니다! 나는 예쁜이 사이트를 발견 할 기쁘게 생각하고 있습니다. 이 특히 훌륭한 읽기 위해 시간 내 주셔서 감사합니다! 확실히 진짜의 모든 비트를 좋아하고 또한 귀하의 http://pencilsketches.org/ 웹 사이트에 새로운 물건을 볼 표시된 도서를 갖추고 있습니다. 이 포럼은 정말 좋은 정보입니다!